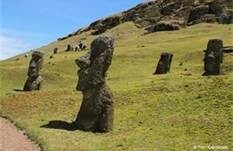 Some people think that aliens long ago built Rapa Nui's Easter islands, long ago. No one actually knows though. If only we were able to find the solutions to the existence of The Rapa Nui. The book "The Secrets of Rapa Nui'' will help you find SOME of the secrets of Rapa Nui. But what is miost important about this book is that it tells us a little more about Rapa Nui even if we believe in aliens or not. 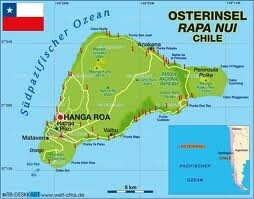 Rapa Nui is located 2,000 miles away from Chile's cost (Easter Island). Did you know that Mysteriously the Rapa Nui's moved to a different place? People say that aliens moved them. But it is still unknown. 3 Rapa Nuis stand staring at the sea. Some Rapa Nui's are smaller than others. Question #1:Where is Easter Island lsland? 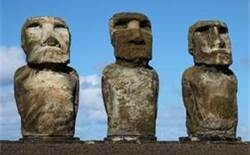 Question #2: Who were the first settlers on Easter Island? Question #3: What are some of the biggest mysteries surrounding Rapa Nui? Anwser #3: The Rapa Nui's Moving Around. Question #4: What do you think The Moai's were moved for? Anwser #4: For More space For another Moai. Polynesia- One of the 3 divisions, of islands in the pacific, the others being Melanesia and Micronesia. Inhabitants-A person or animal that lives in or occupies a place. 1. Rapa Nuis is located in Easter Island. 2. By 1868 all the moai statues had been toppled over, many left broken or disfigured. 3. In 2008 a Finnish tourist was caught chipping a piece of ear of one of the moai statues. 5. Ever since 1975 the residents of Easter Island have held the festival of Tapati to celebrate Rapa Nui culture.